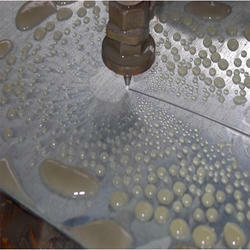 Our product range includes a wide range of water jet cutting machine. With years of enriching experience, we have established ourselves as the noteworthy and reliable name in the domain of offering Water Jet Cutting Machine. This cutting machine is an industrial tool capable of cutting a wide variety of materials using a very high-pressure jet of water. The offered cutting machine is manufactured by our experts by utilizing optimum quality material and leading technology in adherence with the set norms of industry. Customers can avail this cutting machine from us at affordable rates. Looking for Water Jet Cutting Machine ?